The Yoga Sutra, dating from about the third century A.D., distills the essentials of a complex system of physical and spiritual discipline into 200 brief aphorisms. Yoga is at the heart of all meditative practice in Asia, yet until now there has been no first-rate English version of this primary text. Barbara Stoler Miller's translation admirably fills that gap—her clear, strong style and sensitive phrasing convey every nuance of Patanjali's words, and her commentary offers invaluable guidance to anyone seeking to understand Indian philosophy or the practice of yoga. The Yoga Sutra does not propose to offer new knowledge but rather a new perspective on the nature of knowing. As a method of achieving insight, the discipline of yoga is far from mystical ecstasy or ritual trance. Its goal is a contemplative intensity that can unbind the constraints of everyday experience, and that goal helps explain Americans' growing interest in yoga in recent years. This interest has been most widely expressed in the physical dimension of yoga—the postures known as hatha-yoga—but attention is increasingly being directed at the philosophy and psychology that define the discipline. 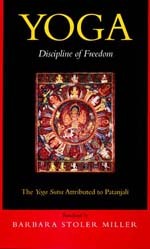 Here the Yoga Sutra shines most brightly; in a world of bewildering complexity and seductive material culture, this centuries-old text offers powerful techniques for countering private mental chaos and moral confusion. The Yoga Sutra has great relevance today, and thanks to Barbara Stoler Miller it is now truly accessible. Barbara Stoler Miller, until her death in 1993, was Samuel R. Milbank Professor of Asian and Middle Eastern Cultures at Barnard College. Among her many publications is her much-praised translation of the Bhagavad Gita.